Welcome to Travel Guide 2 Belgium, the site about travel, tourism and vacations in Belgium. 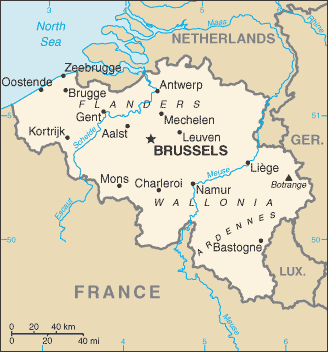 The Kingdom of Belgium is a country in Northwest Europe with a short coastline that borders North Sea. Belgium has land borders with France, Germany, Luxembourg and the Netherlands. The coastal plain region on the country's North Sea shore, is mainly sand dunes, as well as land reclaimed from the sea and protected by dikes ("polders"). In the extreme South of the country lies a region known as the Ardennes (which also extends into France and Germany). The rugged terrain in this region forms rocky plateaus covered with thick forests. Between the coastal plain and the Ardennes, in the center of the country, lies the central plateau. This region provides the most fertile farming land in the country. Belgium's population is about 10.5 million (as of 2005), of whom over 97% live in urban areas. With the a populaton of 886 people per square mile (342 per km2), Belgium is one of the most densely populated countries in Europe. The largest city in Belgium is the capital, Brussels. Other large cities in Belgium include Antwerp, Bruges, Charleroi, Ghent, Liege and Namur. Belgium was the first country in continental Europe to begin industrializing. The country today is one of the world's top trading nations, and has a high GDP and high exports per capita. Belgium was a founding member of the European Union in 1957, is a member of the Eurozone, and is host to many EU, European and NATO institutions.